It was ten years ago this week that Bus & Coach Buyer first took the, then new, Setra ComfortClass S416GT-HD tri-axle coach out for what was the only two day test we have ever conducted. Simon Dew and I joined Setra Sales Manager, Mike Beagrie, on a tour that took us from Dew’s Somersham yard south as far as Fareham. We liked it a lot and predicted great things for it. The ComfortClass sat below the top of the range TopClass which was available in the UK in the form of the S415HD but unlike the vehicle seen as the flagship of the range at that time, the ComfortClass S416GT-HD offered a three axle alternative and the opportunity to accommodate up to 53 recliners and a toilet or 55 recliners and no toilet. In left hand drive you could have the 14m S417GT-HD and the 15m S419GT-HD but in the UK the choice was restricted to the two axle 12.2m long S415GT-HD and the three-axle S416GT-HD which, at 13.02m long, is I believe the longest Setra coach model ever supplied in right hand drive in the UK, though there have been longer left hand drive double deckers. A decade on and a lot has changed. You can’t buy a new Setra any more in the UK, not one with the steering wheel on the right hand side, but that doesn’t mean that Setra has disappeared from the scene altogether because there is a substantial parc of the marque on the road and there will be for many years to come, the last new one having entered service with Talisman Coaches in Essex at the turn of the year. 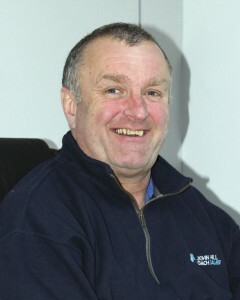 Ten years ago John Hill was working alongside Mike Beagrie running the used coach operation at Evobus UK in Coventry. 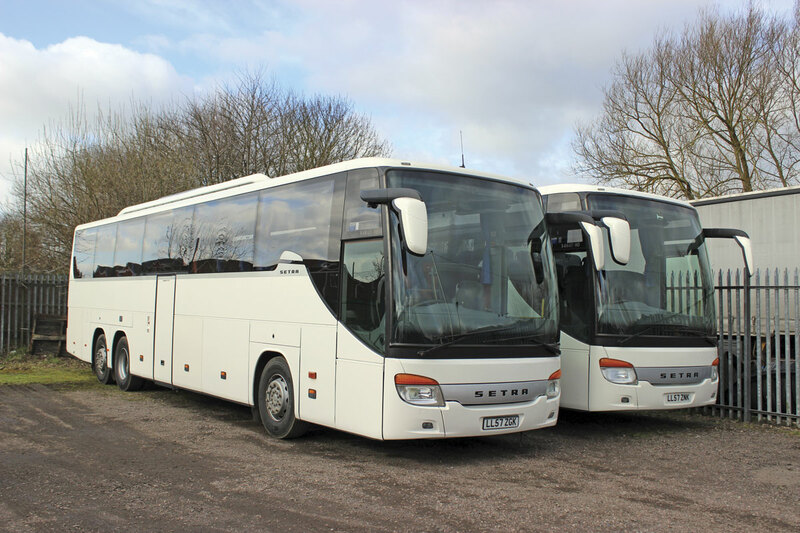 Today, after a period with MAN, he is running John Hill Coach Sales, his own used coach brokerage and dealership based at Melton Mowbray and doing very well with it. I’ve bumped into him a few times recently and a couple of Saturdays ago he suggested that it would be worth taking a look at a batch of coaches he was selling on behalf of JJ Kavanagh, the well known Irish operator. I expressed a degree of reticence because secondhand coaches from Ireland aren’t always as well looked after as you would wish, but he assured me they would not be a disappointment and so it was that last week I rolled up in John’s Melton Mowbray yard to see what kind of value for money a secondhand ComfortClass tri-axle might offer? JJ Kavanagh have operated large numbers of Setras and continue to employ the marque. 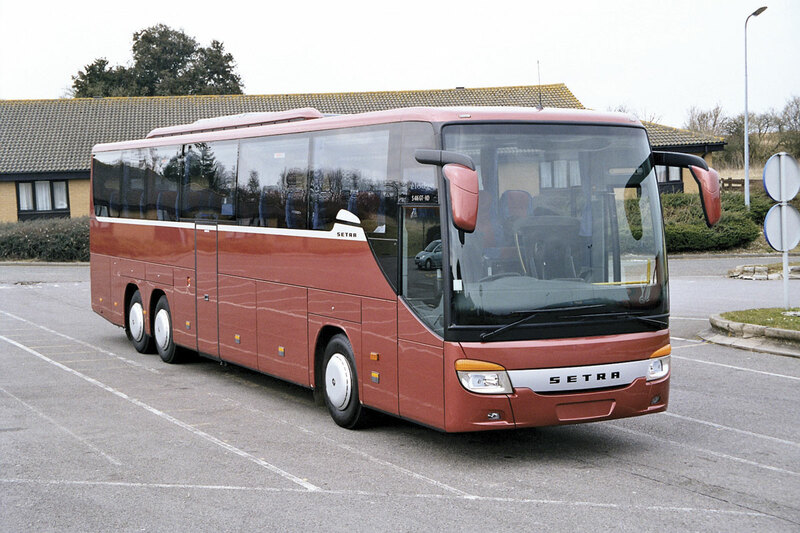 When new in 2008 the Setra ComfortClass S416GT-HD would have retailed at around the £260,000 mark. Seven years on, John is now offering eight of them on Kavanagh’s behalf at a retail figure of £94,950 each. They are a mix of 57 and 08 plates as all were registered between February and April of that year and all originally carried Irish 08 prefix registrations. 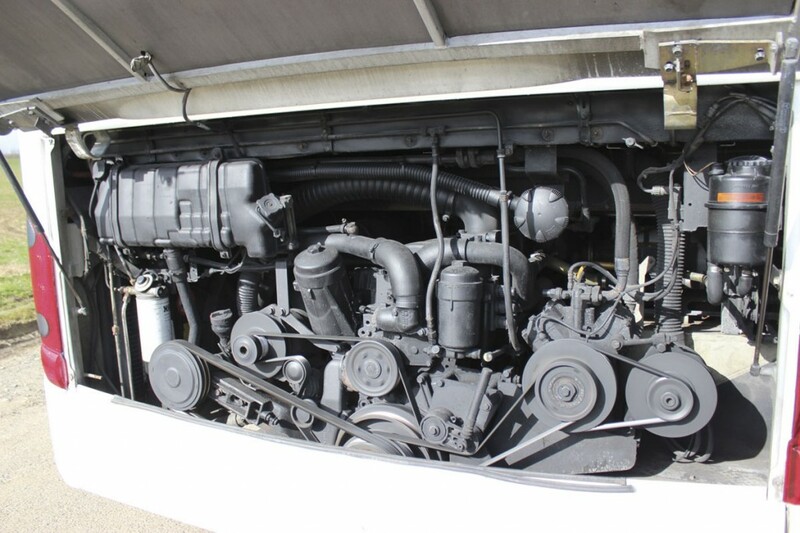 The first two of the octet were in the yard having been recertified, tested and reregistered for the UK and I understand that the remaining coaches will follow shortly. We took out what is now LL57ZGK and was once O8-TN-1 which had covered 554,000km. Some of the others have done more. Each of the pair carried the original white livery in which they were delivered and barring damage that both had suffered to the offside rear lower corner panel they appeared to be free of dents and panel damage, with glazing and light units free of misting and cracks. The vehicle we tried was not fitted with wheel discs, though the other was, but John told me that a set would be fitted prior to delivery. 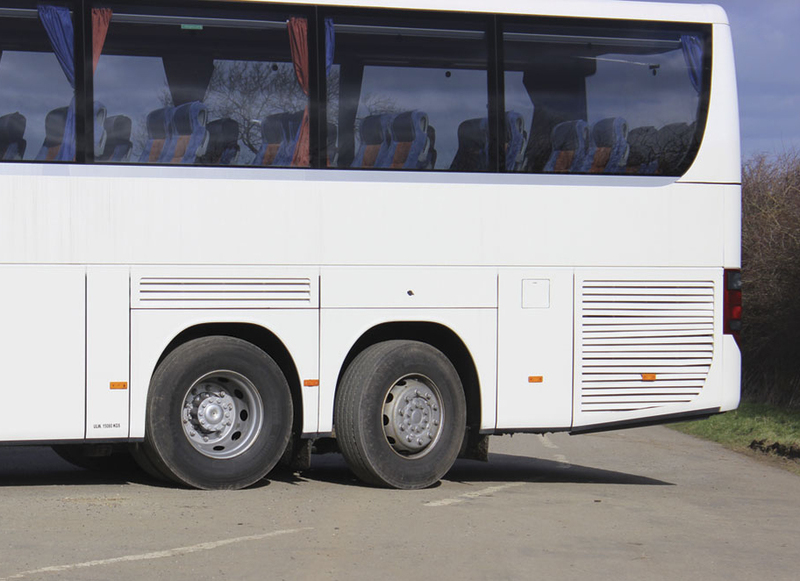 In many ways the specification is exactly what coach operators are looking for. 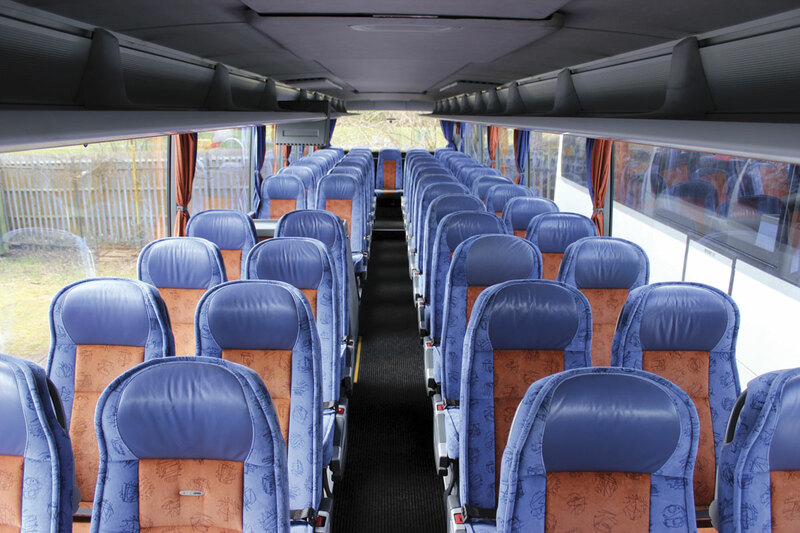 The combination of 53 recliners and a toilet is an increasingly popular one as it enables a coach to be utilised on a broad spectrum of different work and hopefully means that it won’t spend too much time in the yard. Some would argue that 53 and a toilet on two axles rather than three would be preferable, and inevitably the addition of the steered tag axle does mean additional tyre and maintenance costs, but it also means that there should be very little risk of overloading if you are carrying passengers with lots of luggage. The unladen weight shown on the side is 15,080kg and with a maximum GVW of 24,000kg there really is a great deal of scope. 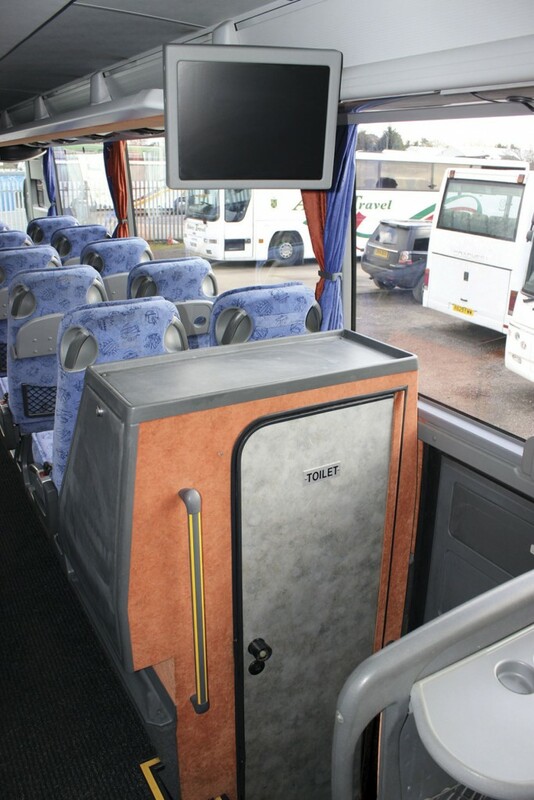 The luggage hold within the wheelbase is easily accessible from both sides, and though the mid mounted sunken toilet does reduce it there is still plenty of capacity. Luggage locker doors are centrally locked manual units that are top hinged, though this wasn’t the only option because those on the demonstrator we tested a decade ago were cantilever units. The luggage area was in generally good condition though a few screws were missing at one end of the edging strip inside the offside locker. Inside the entrance could have done with a little attention as the plastic surround on the lower door mechanism was cracked though complete and there was damage to the lower part of the step edge on two of the steps. This later point was also true of the other coach. 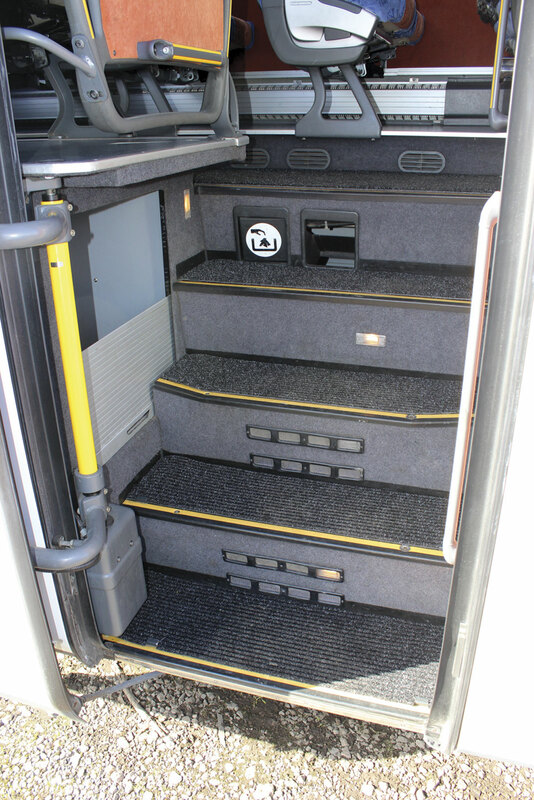 I’ve always thought the Setra’s stair layout one of the better ones, with a useful handrail on the left hand side that could perhaps have used a clean and a diagonally mounted handhold on the base of the courier seat. The dash was in good order with no obvious damage to the plastic mouldings and the instrument panel was also as it should be, save for one button which John now has the replacement part for and will be installing prior to delivery. Setra has always produced its own seats in-house and in the ComfortClass offered three different comfort levels, Ambiente, Nimbus and Top. Ambientes had rouching around the edges so those on the Kavanagh coaches were the Nimbus. Trim was in contrasting blue and orange velour type material with a restrained pattern and blue leather headrests inserts. Folding seat back tables were fitted along with lap belts, folding armrests, grab handles, folding armrests, magazine nets (some of which were clearly brand new), folding footrests, a side-slide facility and a degree of recline guaranteed to cheese off the person sat behind. I have a suspicion that the set of seats may have included a few from another source, some had certainly been switched around. This was evident because the 400 series ComfortClass range have small Setra badges incorporated in the front seats on each side, but the badged double was in the second offside row rather than the first. There were also two doubles with slightly different drop down tables featuring plastic retaining clips that were not fitted on the other seats. There were a few minor marks on some of the seats but nothing significant. This type of material is perhaps more prone to marking than traditional moquette, but does give a more subtly attractive quality feel. The interior from the front. Though there were a few marks on the seat trim, which is more vulnerable to damage than traditional moquettes, the leather on the headrests was in surprisingly good condition and I suspected some had been replaced. The aisle is sunken and had a ribbed carpet fitted, though under the seats was the original flooring which was in good condition, the only fault I noticed being a slight rising of the edges of the covering of a small access hatch. I much preferred the blue flooring of our coach to the salmon pink flooring that featured on the one alongside it, which had similar seats in blue and red. There are a variety of trim variations within the vehicles being offered. The toilet compartment looked in pretty good condition though the toilet seat lid was missing, a part John has already ordered. It didn’t smell either. Externally there were a couple of marks on the trim but they weren’t serious, though I would have wanted to clean the door to the servery unit again as it carried evidence of the chemicals used to clean it. In the centre stair well one of the two small rubbish chute doors was missing and for some reason the shutter door leading to the compartment on the left of the stairwell was only half the depth it should have been. Importantly, the ceiling, racks, sidecasings and other interior items all appeared to be in good condition for their age and though some of that around the door could have been better, the standard of the carpets was good, indeed they may have been new. The Blaupunkt monitors at the front and centre worked, as did other electrical items such as the driver’s blinds and the signalling window. 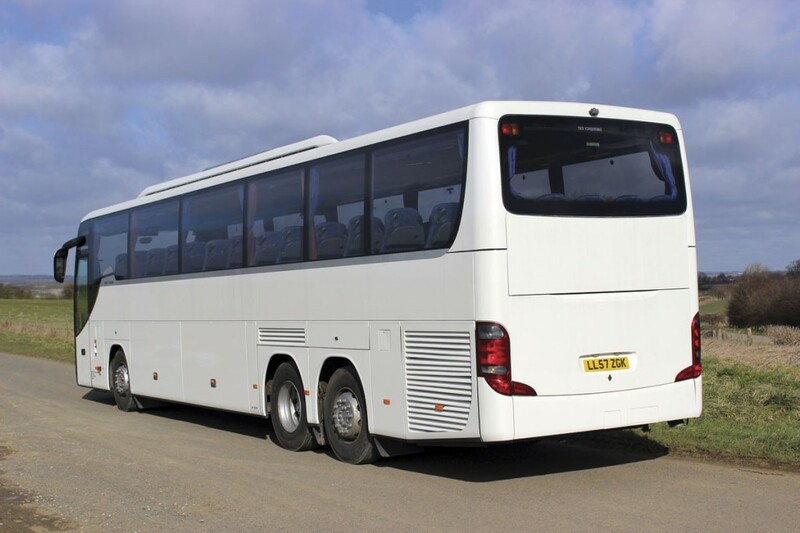 Launched as a Euro3 model, by 2008 the ComfortClass had moved on to Euro4 with an SCR system and AdBlue to provide the emissions control for the 12-litre, straight six-cylinder Mercedes-Benz OM457LA engine developing 428hp/315kW and peak torque of 2,100Nm. This was matched with the ZF AS Tronic 12-speed automated manual transmission. The alternative to the ZF unit was a fully manual Mercedes-Benz GO-210 six-speed gearbox, but these were comparatively unusual. Breezy is understating the weather conditions we encountered and John, who drove, had to correct the steering regularly to counter the gusts on the more exposed sections of the A46 that we encountered. Despite this, the coach always felt stable, or, as he put it, ‘it’s planted, it sits on the road nicely.’ Changes up and down the box were smooth and though you wouldn’t expect a 12-litre unit to be silent it was acceptably quiet, if not quite as quiet as the latest standards. There was plenty of power. Climbing the long steep Broughton Hill on the A606 it went down as low as eighth but kept moving on and crested the top accelerating and changing back into tenth. On less undulating terrain it doesn’t need too many revs; at 50mph in 12th it was only showing 1,050rpm, though earlier at the same speed but in 11th, it had shown around 1,200rpm. On the limiter at 62.5mph in 12th it registered 1,300rpm, the enjoyment of which was marred only by John’s occasional renditions of Queen classics. Freddie did them better. Braking was very capable, as John demonstrated. The retarder works effectively on both the stalk and the footbrake. Likewise, the cruise control worked well and so did the horn, which he tested without warning when we were going through a tunnel. It cornered well too, which is only to be expected with the rear steering facility. Despite the wind, the electronically adjustable front mirrors remained very stable maintaining a clear image with no discernible blind spots. 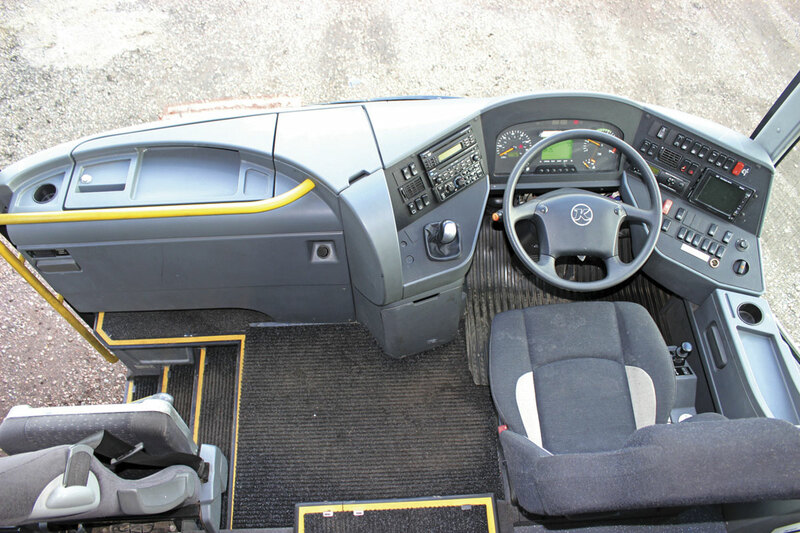 John summarised by suggesting that from a driver’s point of view it was ‘everything you would expect from a Setra’ and this was also a fair summing up of how it felt for a passenger. We experienced an issue with the heating which was possibly an air lock from it having sat for a month or so. If John looked slightly smug at this point it was because the driver’s seat incorporated a heating element that worked effectively. Sitting in the front offside seat row, I tried out the side-slide feature and when returned found that the seat back reclined of its own accord. Concerned that I might have somehow broken it I asked Alan to have a look at it with me and he soon identified that I had failed to return the seat fully after sliding it to the side: once back in place it worked perfectly again, as it had when fully slid out. As we approached Melton on our return, a rubbery squelchy noise was heard, that consensus of opinion attributed to a squeaky airbag. I always have liked travelling on Setras and this wasn’t a disappointment, the seats were comfortable, the noise levels were low and the ride was smooth. Julia was impressed with how quiet it was at the front with very little wind noise despite the prevailing weather conditions. There were some squeaks and rattles, but nothing that concerned her and mostly of the sort that disappear once there are people sat in the seats. She tried out the courier seat and found it ‘very comfortable’ with plenty of legroom. He is confident that the Setras he is offering will readily find new homes, indeed the two we saw had been sold to a Welsh operator on the day prior to my visit. 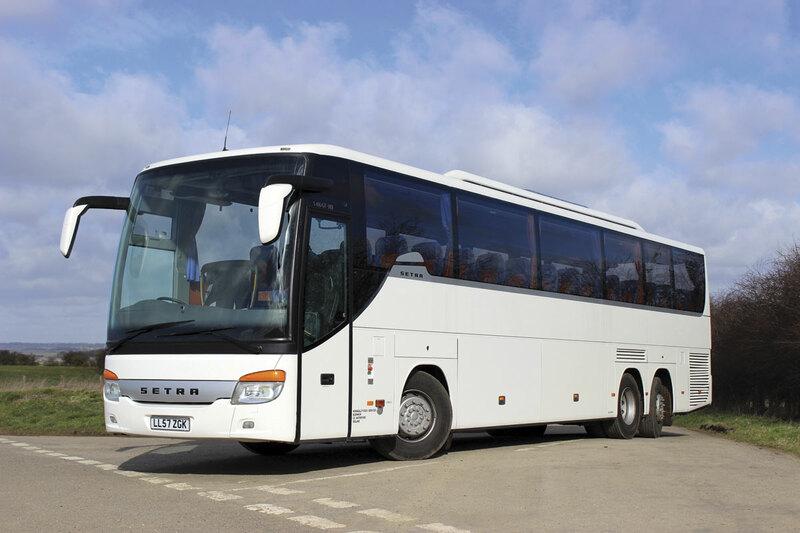 The Setra brand may no longer be available new in the UK or Ireland but it remains well regarded as a quality coach and the Mercedes-Benz driveline is arguably more popular than it has ever been. 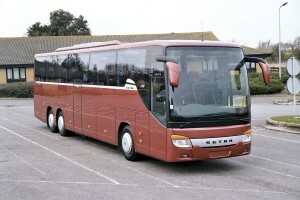 John commented, ‘We’ve sold quite a few Setras, including quite a lot of S315GT-HDs,’ adding, ‘Any used vehicle is only worth what someone is prepared to pay for it but you do get better money for a good Setra – anything with a Mercedes badge.’ He should know about coaches with the three pointed star, he spent close to a decade working for the organisation. John Hill has been somewhat surprised by the extent of his success since he set up on his own almost two years ago. He followed 60 sales in 2013, his first year of trading, with 120 in 2014 and already this year the number is over the 30 mark. He believes that part of the success is down to offering a full sales service from taking the pictures to completing the sale. Hitherto, John has been the hub around which everything has revolved. He has taken the calls on his mobile phone, and it hasn’t always been easy to keep control of them in the manner he would have wished. Now his mobile number has been taken off the website and incoming calls will go through Tracy, which ensures they are all logged and nobody is forgotten if they happen to ring at a busy time. It also ensures that customers are sure to be able to get through during office hours. Her role goes beyond this to make other aspects of the customer experience more professional. She will, for example, be confirming appointments and ensuring that customers have the details of where and when, as well as the necessary contact numbers. The accounts have been transferred to a Sage system and Tracy has started learning all about it. It is important to John to know exactly how the business is doing at any time and this investment will ensure that the production of monthly management accounts is much easier. ‘It’s giving us a more all-round approach to what we do,’ he said. He does not want to go mad and rack up overheads, but there is a difference between that and running so lean that you can’t meet customer’s needs. With additional personnel the office has become rather outgrown and to address this, the office next door is also being taken on and combined with the existing one. He is also working on developing the website to make it more compatible with mobile devices, though, for now, he is not looking at an App. ‘It’s crazy busy at the moment,’ he said. 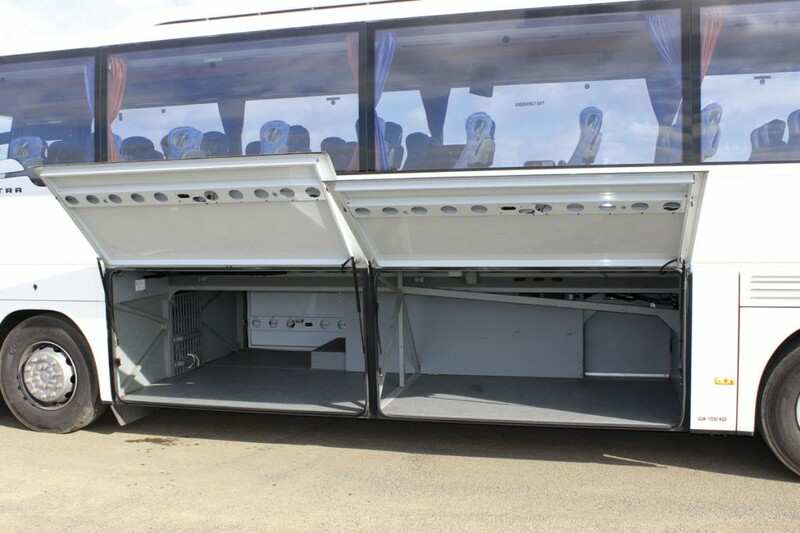 ‘It’s nothing specific, it’s everything, though 53 seaters with toilets like those you’ve seen today are certainly on the up, without a doubt.’ Most of the vehicles offered are operator’s vehicles, though he does also offer coaches on behalf of dealerships, and on occasions coaches have been bought to resell. He will always consider taking part exchanges. 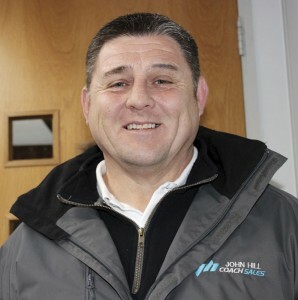 The first two years for John Hill Coach Sales has been a tale of remarkable success and John is looking to consolidate this and improve the service offered, as the appointment of Tracy illustrates. Looking forward there is an air of expectation and a belief that the job he is doing is one that is genuinely useful to his customers, whether they are buying or selling.